How has the area changed? Many residents lived in the area long before Phelps Dodge built Playas. They have seen the progression of change in the area. One resident describes it below. "It used to be only scattered ranches and people were really isolated. When the smelter went in, it wasn't only that a lot of new people moved in; it was also that we now had a community store and swimming pool and other things that people gathered around. Playas became the center of a lot of activity that had nothing to do with the smelter. Everybody knew everybody else for years around here. Then, when the smelter closed down, it went back to like before with people really not congregating anywhere together. When PTRC came in, it brought a lot of locals together again in many ways and reconnected people in a common job. Through all those years, one thing didn't change. That's the people and how they are friendly and welcoming to others, whether they are moving in or just passing through. The basic values of the area are the same as they have always been..focused on doing a good job and living as best we can." Located in the Playas Valley, the town site of Playas sits cradled by the Little Hatchet Mountains to the east and the Animas Mountains to the west. A seasonal lake bed (the "playa" from which the valley and town derived its name) lies in the valley, filled mainly by the monsoons of July. The level fluctuates with precipitation during the year. The Little Hachet Mountains hosted several mines during the mining peak from the late 1880's through the early 1900's. The area was selected because of the valley's abundant water supply for railroad operations. In 1902, Phelps, Dodge and Company built the El Paso and Southwestern Railroad to tie El Paso, Texas, to copper mines of Bisbee, Arizona, and other Arizona mining towns. New Mexico's Hwy 9 grew along the railroad, creating a "Border Route" between Columbus and Rodeo. The valley grasslands grew a healthy cattle business, viable with the building of the railroad. The Playas Siding was as major station at which cattle were loaded for market. In 1971, many years after operation of the railroad ceased, Phelps Dodge (PD) built a copper smelter about 10 miles south of the siding. Because the area provided little housing options, PD built a town for employees of the smelter. It was isolated, but complete with 250 rental homes, six apartment buildings, bowling alley (Copper Pins), grill, rodeo ring, helicopter pad, parks, fitness center, shooting range, medical clinic, community center, baseball fields, bank, large mercantile, post office, and swimming pool. The town maintained about 1000 residents and became a commerce center for ranchers and area citizens. The smelter itself was a modern flash smelting operation and processed copper brought long distances from mines. A railroad vein was installed to ship the ore in from the existing line through Lordsburg, 45 miles to the north. The 200' stack was called " La Estrella del Norte" by illegal migrants using its light to navigate from Mexico, a mere 20 miles south. Copper prices fell and in 1999, PD made the decision to close the smelter and the town. A skeleton crew remained housed in Playas to manage the ongoing environmental maintenace as and after the smelter was demolished and removed. Four years later, New Mexico Tech signed a $5 million purchase agreement with PD. 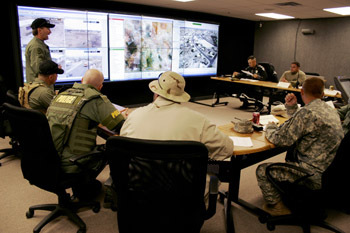 The town became a training arena for first responders and counter-terrorism programs and soon expanded its capabilities for military, Border Patrol, law enforcement, and research entities. As training ranges became consistently utilized, new structures and venues were built and implemented, both within the premises and on surrounding land leased from local ranchers. Today, the Playas Training and Research Center accommodates national and international training and research. Its reputation has grown and is respected in many security arenas. Transformation to serve your needs!